DESCRIPTION Prime inner City location with expansive space inside and out. Front driveway access makes room for a large sunny south backyard that is fully fenced, landscaped, and topped up with a patio, pergola, hot tub, and outdoor fire place. The elegance of this brick faced home does not stop at the front door. With 3 finished levels (including basement) > 3,600 square feet welcomes a dedicated office, and a formal dining room. Main floor living area is bright and open and layered with maple hardwood floors. Kitchen boasts stainless steel Bosch appliances, granite countertops and island with a raised eating bar and is open to a large nook area and living room. Upstairs are 2 large bedrooms, laundry room (with window), and an absolutely huge master bedroom and en-suite bath. The master has its own balcony, a large soaker tub, walk-in shower, walk-through closet and a sitting room with 2-way gas fireplace. The basement is fully developed with in-floor heat, a 4th bedroom, and bathroom, bar area, and extra storage. Home for sale at 417 29 AV Ne Calgary, Alberts T2E 2C6. 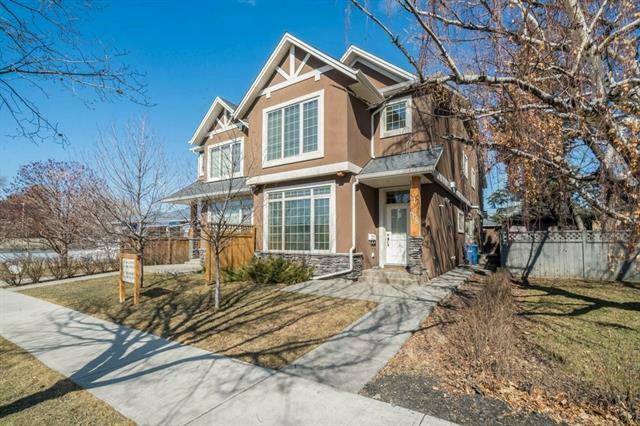 Description: The home at 417 29 AV Ne Calgary, Alberta T2E 2C6 with the MLS® Number C4225966 is currently listed at $1,040,000.